You are a master of magic, bending strange energy to destroy your enemies! Your spellbook is your best weapon, armor, and more! Wizards can’t wear armor. In Section E of your character sheet, don’t check any boxes, and write: club, dagger, heavy crossbow, light crossbow, and quarterstaff. You can cast wizard spells! Every morning, you spend an hour studying your spellbook to decide the spells you want to cast that day. This is called “preparing your spells.” When you cast a spell, mark it off from today’s list of prepared spells. Each day you can pick different spells from your spellbook—they don’t have to be the same ones each day. Choose one of these items: masterwork dagger, masterwork quarterstaff, ring, or wand. Write arcane bond and this item in Section F of your character sheet. You get this item for free. Once per day, you can use it to cast any one spell in your spellbook. You don’t have to prepare this spell ahead of time—using the bonded item is like an emergency backup spell that isn’t written down on your list of prepared spells. Replacing a lost or destroyed bonded item costs 200 gold pieces. As part of your training, you learn about all kinds of spells and choose a type (or “school”) of magic that’s really interesting to you. The schools are Universalist, Evocation, and Illusion. In Section F, write your school name and the names of your school power or powers. If you have restricted spells, write them at the bottom of your spellbook in Section K.
Universalist wizards learn a little bit about every kind of magic. You can learn to cast any spell. You can magically throw your melee weapon at an enemy up to 30 feet away. Your attack roll is 1d20 + attack bonus + INT. The weapon deals normal damage + STR, and instantly returns to you. You can do this a number of times per day equal to 3 + INT. Conjuration magic moves energy and matter from one place to another. 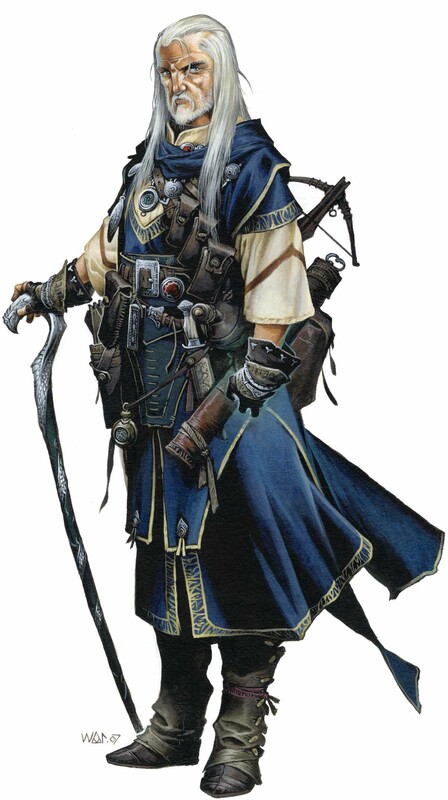 Conjurers focus on attack and defensive spells rather than illusions or mind-affecting magic. At 3rd level, conjurers can cast acid arrow once per day without having to prepare it. At 5th level, conjurers can cast stinking cloud once per day without having to prepare it. RESTRICTED SPELLS: You can never learn or cast charm person, deep slumber, disguise self, displacement, hideous laughter, invisibility, sleep, or suggestion. You can cast the mage armor spell once per day without having to prepare it. You unleash a liquid dart of acid. Make a ranged touch attack roll against a target within 30 feet. If you hit, the acid deals 1d6 points of acid damage + 1/2 your wizard level. Using this ability is a standard action. You can do this a number of times per day equal to 3 + INT. Evocation magic is all about creating and controlling energy. Many evokers focus on attack spells rather than defense or trickery. RESTRICTED SPELLS: You can never learn or cast acid arrow, disguise self, displacement, invisibility, mage armor, stinking cloud, or web. You can cast the burning hands spell once per day without having to prepare it. You blast one opponent within 30 feet, dealing 1d4+1 points of damage. Using this ability is a standard action. You can do this a number of times per day equal to 3 + INT. Illusions can make things disappear or change their appearance. Illusionists are good at fooling people, but have a hard time with some spells that move or alter physical objects. RESTRICTED SPELLS: You can never learn or cast cause fear, false life, feather fall, fly, haste, knock, levitate, or vampiric touch. You can create a blinding ray of light. Make a ranged touch attack roll against an enemy. If you hit, you automatically blind the enemy for 1 round. You can do this a number of times per day equal to 3 + INT. You can cast the disguise self spell once per day without having to prepare it. Every spell you know is written in your spellbook. You start knowing only a few spells, but you learn more as you become more powerful. You can also copy spells from scrolls or from another wizard’s spellbook. If you lose your spellbook, you can’t prepare any spells from it until you get it back or get a replacement! Source: Paizo Blog, Paizo LLC. Add two new 1st-level spells to your spellbook. You can prepare another 1st-level wizard spell each day. Add two new 1st or 2nd-level wizard spells to your spellbook. You can prepare one 2nd-level wizard spell per day from your spellbook. If your intelligence is 14 or higher, you can prepare an extra 2nd-level wizard spell each day. Conjurers can cast acid arrow once per day without having to prepare it. Evokers can cast scorching ray once per day without having to prepare it. Illusionists can cast invisibility once per day without having to prepare it. You can prepare another 1st-level wizard spell per day from your spellbook. You can prepare another 2nd-level wizard spell per day from your spellbook. Add two new 1st, 2nd or 3rd-level wizard spells to your spellbook. You can prepare one 3rd-level wizard spell per day from your spellbook. If your intelligence is 16 or higher, you can prepare an extra 2nd-level wizard spell each day. Conjurers can cast stinking cloud once per day without having to prepare it. Evokers can cast fireball once per day without having to prepare it. Illusionists can cast displacement once per day without having to prepare it.